War films of a certain era hold a special place in my heart. Films like The Longest Day and Mosquito Squadron were so exciting and nerve wracking. As a kid, the action sequences would have me on the edge of my seat with the tension. I finally relived that feeling at EGX while playing Bomber Crew from Runner Duck. 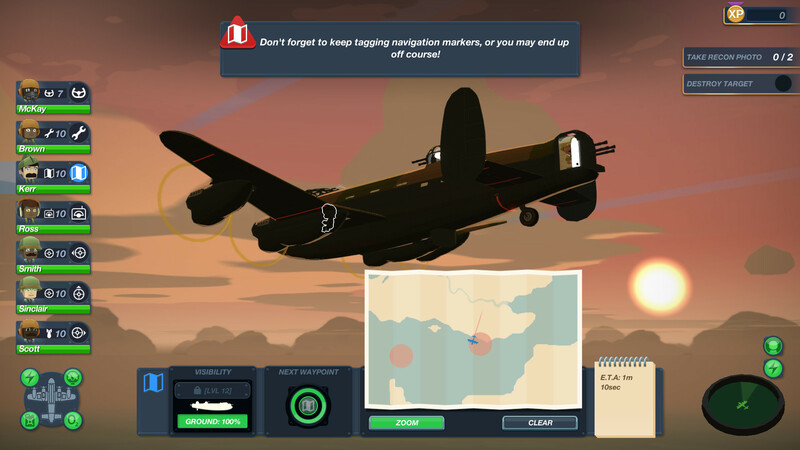 It’s a strategic survival game where you take an RAF bomber to the skies during World War Two, guiding them to victory…or to a miserable failure. 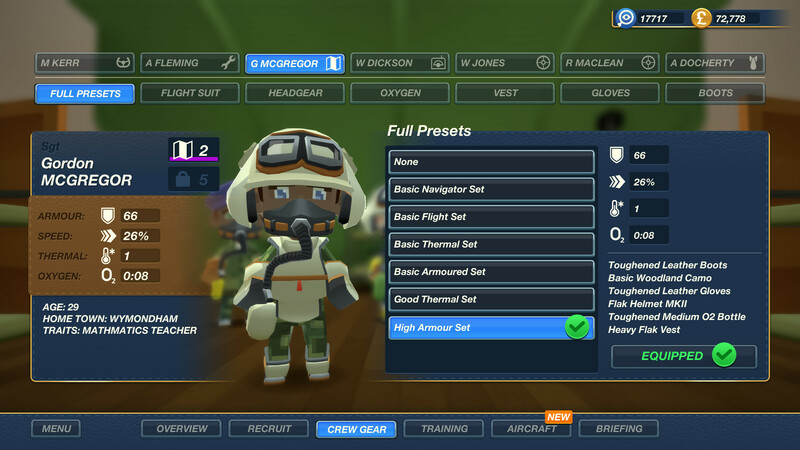 The mission available in the EGX demo saw your crew and plan fully locked and loaded for flight, but there was some money in the bank to play around with things. Before entering the mission briefing, I ensured my crew all had nice warm boots and gloves. Memories of those war films told me that the crew can get pretty cold in the bombers when flying at high altitude for any length of time. Playing around with the bomber itself was even more fun. It was equipped to a pretty high level, with a good range of guns and armour to protect the plane. I did fiddle around with the supplies by adding in some medkits, and of course, added some fierce looking decals around the engines and nose of the plane. I didn’t look at customising any decals, that would have just made the loss of the plane even more heart breaking. Next up was a quick briefing informing me of the mission goals – take some recon photos, destroy an airbase and watch out for a German Ace who has been reported in the area. With the formalities complete, to the bomber I went. With some lovely animation of the crew moving around inside, I told the pilot to take off and lift the gear. Flying along, keeping the navigation in order I instructed my gunners to take out some enemy fighters that were incoming. Easy. Crossing over the French coast, my bomber came under heavy flak fire as I took the recon photo. Part one of the mission accomplished, I ordered us to climb in altitude to get away from the flak. Little did I realise that my engine was on fire, we had drifted off course, and enemy fighters were incoming. 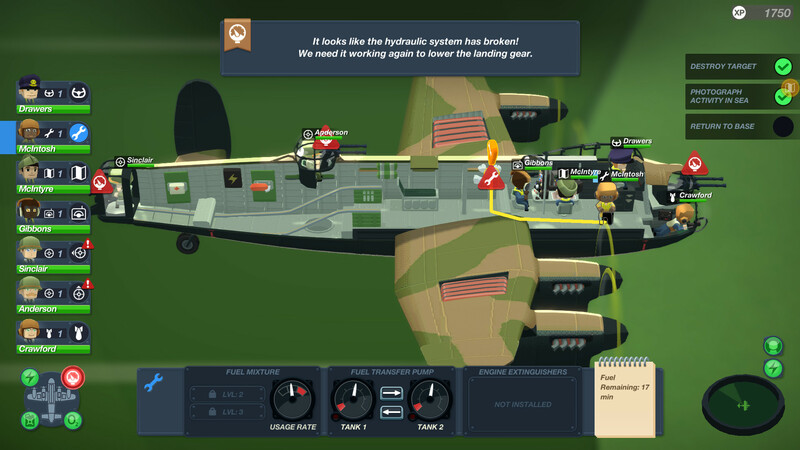 A help prompt suggested sending someone out to fix the engine, or trying an emergency dive to put the fire out. Not wanting to divert crew from their guns, I opted for an emergency dive. I started all over from the top. Equipped my crew. Prettified the bomber. Had the briefing. Went flying. The first half of the mission went smoothly and I arrived at my recon target feeling calm. Then the flak and the fighters came. It was all hands to battle stations as I moved my engineer to the gun turret on the belly of the plane. I luckily escaped the flak without any engine fires and proceeded towards the bombing target. More fighters appeared as I neared the target. Having to hastily mark them up for my gunners to ensure we weren’t ripped to pieces, I lost track of keeping our navigation on track. A circuitous loop around Northern France got us lined up for a bombing run…just as an engine caught fire. I couldn’t sacrifice my crew member who would do the bombing, so my belly gunner went walking on the wing to repair the engine. Scary! The bombing run missed. Those vital seconds between selecting the bombs, and realising I had to open the bomb bay push us past the target. Alas, this is what happens when trying to survive! Mission only half complete, we turned to head home. I sent the crew hurrying this way and that to ensure we could keep flying. Engine fixed, gun turrets manned and suddenly an alarm rang out to say that the hydraulics were failing which would mean we couldn’t lower the landing gear. The rear gunner had taken a hit and only had minutes to live. Despite the German Ace harassing me constantly, I had to take care of the plane, and my crew. I sent one running to repair the hydraulics (no wing walking required thankfully), while another grabbed a medkit and helped his wounded crew member. At this point I noticed we were drifting off course again, a hasty correction put us back on target, at which point the Ace backed off, and it was easy flying back to base. With a fuel alarm ringing out all the way of course. Once I landed, my heart was pounding, my knees weak, and my palms sweaty. But the plane and all the crew survived. I was happy. I now can’t wait for the game to be released this October, but I’m going to have to become better and managing the dangerous situations. Sacrifices might have to be made. After all, I don’t want to accidentally ditch another plane. 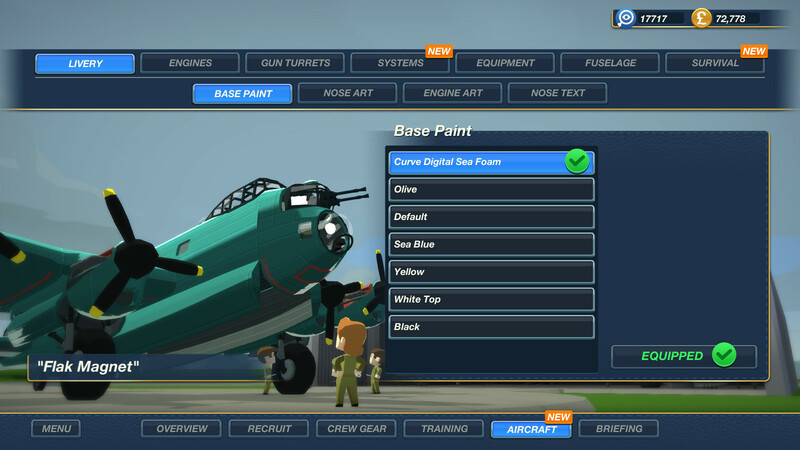 Bomber Crew releases 19th October on Steam.